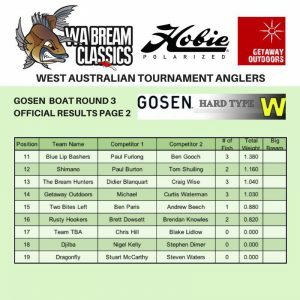 The third round of the 2018 Getaway Outdoors & Hobie Polarized WA Bream Classic Boat Series brought to you by Gosen got underway with a relatively small field of 19 teams heading out to tackle the Swan River’s iconic Black Bream. The river has only just started to settle after a period of persistent rain throughout a winter which seemed like it was never going to end. In that time while many of us are indoors and out of the nasty weather, the bream were busy fattening up as they are drawing ever so close to spawning. 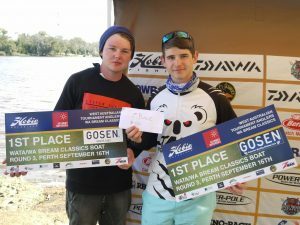 This meant that the teams who managed to find the fish were going to find them in a big way and the results at the pointy end most certainly reflected that. ction dried up for the pair. The two anglers used JML perfection rods matched with Daiwa 2500 Luvias and Exist reels. Spooled on each of their reels was 11lb Yamatoyo Jigging braid and connected to the ends of their braided lines was Yamatoya 6lb Harris Fighter fluorocarbon line. Gosen Casting braid and 6lb Daiwa J-braid. 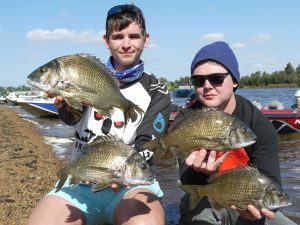 In an event where many big fish were caught there is always one bream that sets itself apart from the rest and Kim McIntyre’s 43cm bream was just that. This donkey weighed 1.250 kilos and was caught on a 2.5-inch Motor Oil Zman Grub. 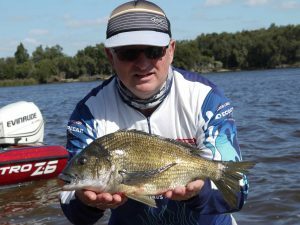 The fish smacked the lure with force, resulting in Kim’s 1/16th Jim Allen Jighead to be firmly embedded into the bream’s mouth before a frantic fight unravelled. Kim wound like mad on the reel to stop this fish from getting back under cover and busting him off which he did to great effect. Ok,so that wraps it up for the qualification rounds in this year’s WA Bream Classic Boat Series. 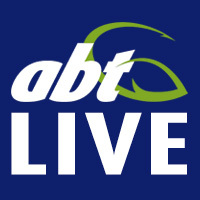 Congratulations to everyone who managed to qualify for the grand final and if you weren’t so lucky this year then we hope to see you back next year to give it another crack.